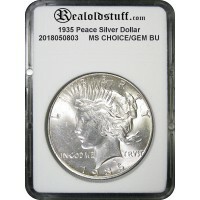 This is a Choice/Gem BU (MS64) example of a 1935 silver Peace Dollar from the Philadelphia mint. It has blazing cartwheel luster on both the obverse and reverse with clear fields devoid of any major marks or scratches. It has a full strike and full silver white color.